Recently, the use of microsystems for biomedical applications is getting more attention. Such microsystems consist of one or more chips, a sensor, a battery, an electrode, etc. They are developed to be used on or close to the body, or even inside to body. In case of in-vivo use, a lot of extra measures have to be taken into account: the body has to carry the implant without harmful consequences, and moisture from the body should not penetrate into the implant, leading to corrosion resulting in failure of the microsystem. Hence a biocompatible and hermetic package is needed for such implantable systems. Traditionally, an implantable system is placed into a rigid Titanium box. Such box is indeed biocompatible and hermetic, but it makes the implant rather big, which is an important drawback for the patient (less wearing comfort and more pronounced reaction of the body on the system). With the current knowledge of IC and MEMS technology, biomedical systems can be made very small, but a compact device package is still missing. Such a package is under development at imec. Since the reliability of the package should be very high, the package consists of various levels. 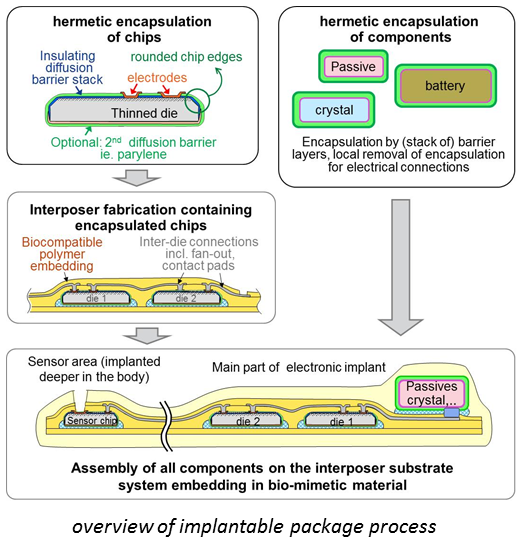 First each chip or subcomponent is packaged individually in a hermetic encapsulation made by barrier layers such as parylene-C or stacks of organic/inorganic layers. Currently, various materials are evaluated in-depth regarding their barrier properties for long term implants. In a next phase, all chips are encapsulated in a so-called interposer, using an implantable polyimide as carrier. 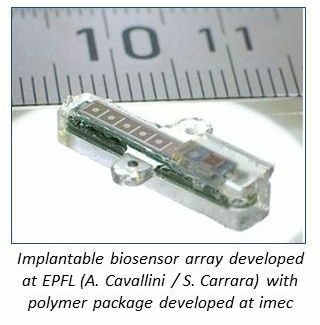 Finally, all sub-components are assembled on a carrier and packaged using a biocompatible system encapsulation, such as an implantable PDMS or polyurethane. Metal interconnects are typically from gold or platinum due to their excellent corrosion resistance. Obviously all materials used for this new packaging technology are biocompatible, and both components and package materials should be suited for sterilization. Since biocompatibility is dependent and the duration and location of the implant, material selection might be optimised towards a specific application. 1. M. Op de Beeck et al, “Design and characterization of a biocompatible packaging concept for implantable electronic devices”, Proc. Of 44th Intern. Symp. on Microelectronics, Long Beach, USA, Oct. 2011. 2. K. Qian et al,” Novel Miniaturized Packaging for Implantable Electronic Devices”, IEEE-IICT conf, USA, June 2012. 3. M. Op de Beeck, et al., “Biostability and corrosion resistance of a biocompatible encapsulation and interconnect technology for implantable electronics”, Proc. of 45th Intern. Symp. on Micro-electronics, San Diego, USA, Sept 2012. 4. M. Op de Beeck at al. “Improved chip & component encapsulation by dedicated diffusion barriers to reduce corrosion sensitivity in biological and humid environments” , EMPC 2013, Grenoble, France, Sept 2013.